Ahh, the end of the another year, where we look back at all the we accomplished (or didn’t) in the last year and all we want to accomplish (or wish we would but won’t) in the next. Honestly, though I’m being a bit snarky about this, I’m actually a big fan of society’s collective moment of taking inventory of our current place in lives, accepting that which we have and cannot change, while looking forward to the hope of a future that we can still yet affect. With that said, and as I too wonder where my next year will take me (aren’t I always wondering though? Isn’t that, like, one of my main themes in this blog? Hope…hope for what can come…(and thank you OneRepublic for “I Lived” playing on Pandora right now and making me wistful… 🙂 )…sigh…so before I go off on too far of a sentimental tangent, here are The Screenwriter’s Wife’s Top 10 Posts of 2015! MY Top Ten opinion: These are MY favorite posts I’ve written this year. 9) How Our Family of 4 Lives Happily In a 700 Sq. 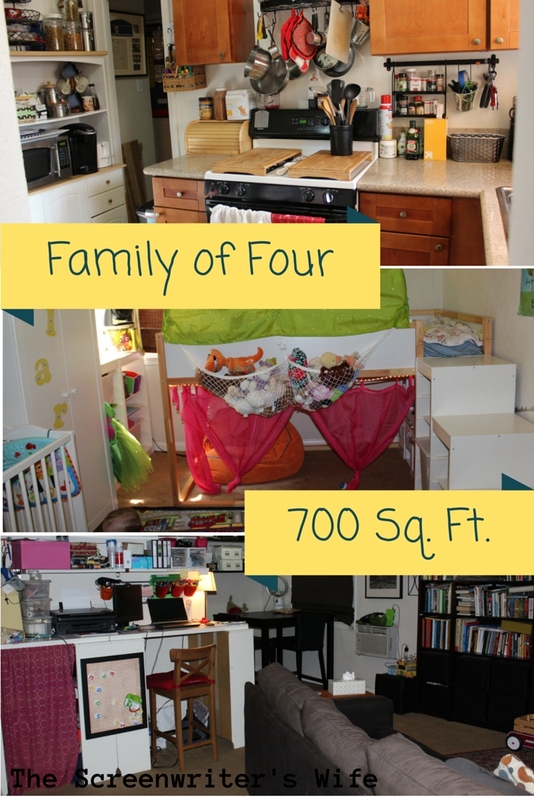 Ft. & Small Home Ideas & Family of Four, 700 Sq. Ft., and a Small House Living Room Re-Do – I’m pretending these are the same post, because in a way, they are. Thanks to Money Saving Mom for sharing, this post put me on the “blog map” and I’m forever grateful. 8) Signs, Signs, Everywhere a Sign. Very Well Told. And Hope. – Keepin on keepin’ on; its what we do best. It’s also all we can do. 7) The Complete List of Date Night Subscription Boxes – this post is my most pinned one as well as the one that’s actually brought me a little bit of affiliate money. Plus, I’m not gonna lie, I LOVE the idea of these boxes and of encouraging other couples to do more date nights and I’m looking forward to trying out more of the boxes myself in the new year. 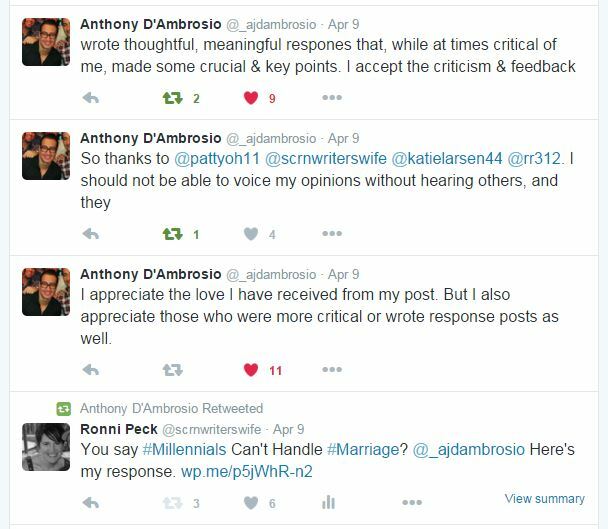 6) Why Millennials CAN Handle Marriage – This was the first time I ever thought, hey, I don’t like what I just read in a trending article so I’m going to do something about it by publicly responding! And it was freeing to get off my chest. And cool to share, via twitter, with the author and know that he read it. As much as I often loathe social media, in this particular instance, I’m thankful for the opportunity it presented. 5) The Ashley Madison TV Show & The Good That Could Have Been – I probably could have posted this during the middle of the big fiasco and gotten a ton of hits off the publicity, but I didn’t. Still, it was worth sharing and seeing a different perspective than written about anywhere elsewhere. 4) Making Saul Goodman – almost no one read this post. And really, it wasn’t a blog post anyway, but a re-posting of a late-night twitter stream. Still. For some reason I liked this a lot. 3) How to Keep Going When Your Marriage Is Hard. Really, Really Hard. Part 2 – More people read Part 1, but I prefer Part 2. The post(s) had been in my head since even before I started a blog; I just needed to figure to how to write it out and wait for the courage to share it. 2) When You Have High Hopes (& The Tide Seems to Be Rising) – Almost poetic in this one I am. 1) I Want It All, And I Want It Now. (& Where Am I Going With All This Again?) – You have no idea how many weeks it took me to hash this one out. I wanted to say it all, everything, and I wanted it to make sense in the small confines of a blog post. Which of course life (and blog posts) don’t work that way, but still, I wanted it all to work. I still want it all to work. But I accept that it won’t. YOUR Top Ten opinion: These are my top posts as far a hit count goes. 7) Hindsight #2: The Person You Marry Will Change – this was written in 2014, but it was still a top post clicked on in 2015. 5) When Marriage Is Hard. Really, Really Hard. Part 1. How Our Family of 4 Lives Happily In a 700 Sq. Ft. & Small Home Ideas. To put things into perspective here, this single post accounts for about 56% of all the traffic on my blog, ever, including every post since I started this blog almost 2 years ago combined. This post has received over 6 times as many hits as #2 (Living Room Re-Do), almost 8 times as many hits as #3 (Millennials Handle Marriage), and about 100 times as many hits as #10 (Datelivery Giveaway). It’s the clear winner. Clearly. 1) Go camping overnight – at least once – as a family. CHECK! Twice! 3) File a utility patent. Done. And ugh. I never wrote much more about it in this blog. It was exhausting. Note to any future inventors: Don’t write and file your own patents. Even if you think you’re smart enough to do it. Just, it’s a lot. You’ll burn out and then never want to talk about it again. 5) Clean out the garage/back yard. Kind of. We had a huge garage sale, if that counts. And at one point this spring/summer, my backyard did look kind of nice. So I’m gonna go with a pass on this one. 6) Be more social and hang out with real live people 3 times a month. Hmm…I do think I was more social this year. Joined MOMS Club and everything. I don’t know if it was exactly 3 times each month, but I’ll say it was close enough. 7) Write at least 60 blog posts. This is post #59 this year. Ha. I guess I gotta get in one more in the next 2 days.